Posted March 12, 2019, 3:41 p.m.
Posted Jan. 24, 2019, 10:17 a.m.
Posted Nov. 16, 2018, 9:52 a.m.
Juan Romero woke up before the sun rose each day. The 58-year-old would slip quietly into his uniform for his job at Kaiser Permanente Medical Center: black pants and shoes, a white collared shirt with a striped tie and a cherry-colored vest on top. But on Wednesday Nov. 7, 2018, Romero, who was known for being punctual and hardly ever missing work, didn’t show up to his 6 a.m. shift. On that overcast morning, Romero was discovered at 5:54 a.m. by a California Highway Patrol officer in a stopped, dark green Toyota Corolla on the Soto Street on-ramp to the 10 Freeway, according to police. The officer pulled over to check on the car, which was stopped on the left shoulder, and found Romero sitting unresponsive in the driver’s seat with the motor running. Police said Romero was shot through the driver’s side window by one or more people who may have been driving on the same freeway. Romero’s car then hit the right shoulder before veering to the left, where it crashed on the left shoulder. Romero was pronounced dead at the scene. Det. David Alvarez of the Los Angeles Police Department said it’s unknown why Romero was shot and killed. For the last four years, Romero drove a shuttle for Kaiser Permanente on Sunset Boulevard, taking patients and employees to their doctors’ appointments or job sites. Born in Puebla, Mexico, on Jan. 27, 1960, Romero was the second-youngest of nine children of meat store owners Juan Romero and Enedina Gordillo. Romero’s wife, Hermila, said that he liked to tell childhood stories of helping his parents, who would send him and his siblings to the nearest butcher shop every morning to pick up fresh meat to sell. That responsibility as a child instilled in him a strong work ethic. According to his wife, Romero moved to the United States around 1972 after one of his brothers persuaded him to find work across the border. By the late 1970s, Romero had met Hermila while the two worked at a sewing factory in downtown Los Angeles. Romero, who was 18 then, wasn’t discouraged by the 14-year age difference between the two and eventually, the two were married. In the years since, Romero has worked as a parking attendant, a dishwasher and at one point, the couple owned a mini market for nearly a decade in southeast L.A. The couple eventually sold it in 2005 because they were burned out from the demands and responsibilities of running it, Hermila said. Romero liked to travel and bowl, his wife recalled. When the two met, he was on a bowling team that included his manager and other coworkers. Romero also liked to go to the San Pedro pier to fish and if he caught extra seafood, he'd give it away to friends and family. Sometimes, though, he’d keep his catch and cook soups and stews for himself and Hermila. On a recent afternoon, Hermila sat in her living room with her niece and goddaughter, Viviana Talamantes. Photos of Romero hung on the walls and dotted the dining room table. “He loved mojarras the most,” Hermila said in Spanish of the fried fish plate, which he’d butter, season with herbs and spices, and place in the oven until the skin was browned and crispy. Among Hermila’s most cherished memories with her husband were at Boyle Heights’ El Mercado de Los Angeles, also known as “El Mercadito de Los Mariachis,” where they’d feast on tostadas and sway to live mariachi music. But there was one other place he loved more than El Mercadito. Though a devout consumer of Sizzler's salad bar delights and ice cream, Romero was most loyal to his family. When Hermila was diagnosed with cancer three years ago, Romero was attentive and supportive. He’d take time off work to be with her during chemotherapy appointments. Hermila was in Mexico visiting family when Romero was killed. Had she stayed, she thought, Romero wouldn't have died. As tears streamed down her face, she said she regretted leaving the country at all. “You can’t say that,” Talamantes said, consoling her. “He was going to work. It was his routine,” she said. “Nothing was going to stop him from going to work that day, even if you were here." 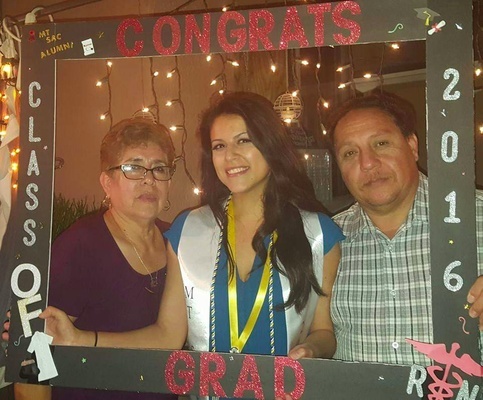 Photo, above: Juan Romero, left, with his niece, Viviana Talamantes, center, and his wife Hermila, at a celebration for Talamantes' graduation from Mt. San Antonio College's nursing program in 2016. Photo, right: Juan and Hermila Romero at Hermila's 70th birthday party. Photos courtesy of Viviana Talamantes. I hope the shooter is located. — Babs Jan. 26, 2019 at 4:45 p.m.